You can find screen protectors for every iPhone and most Samsung phone, but what about the devices you can’t? Australia now has a way of getting your other gear protected and it won’t cost much. Protecting your phone is more or less a given these days, as they carry our livelihood. Cracked screens make using those devices more difficult and certainly unsafe, and it also makes a dent on the resale value, as well. That makes screen protection important, and something we want for anything that we’re using. Our phones, definitely, but also wearables, tablets, camera screens, and more, but only some of these are easy to find. You can usually find a screen protector for a phone, though it usually has to be a popular one. Apple iPhones and Samsung Galaxy handsets tend to be easy, and Google Pixels aren’t too much trouble either. But screen protectors for phones made by Huawei, LG, Motorola, Oppo, HTC, Sony, and Alcatel aren’t always as easy to find. Sure, some companies get screen protectors applied out of the box making a new phone ready to go when you buy it — that’s on most Oppo phones, and a few by Huawei, too — but finding screen protectors for phones that may not be as popular as the Apple and Samsung ones is never easy. The same is true for wearables that might get easily scratched, while tablet protection is almost impossible to find. You can usually find tablet cases, but tablet screen protection? That can be a little like camera screen protection, which is equally as troublesome. Fortunately, Australian cities may well be getting protecting for pretty much any device they can think of, as a technology that has been tested in Europe and recently New Zealand comes to Australia. It’s a concept produced by Zagg, owners of the Invisible Shield screen protector product, which is rolling out a screen protector printing technology called “Invisible Shield on Demand”. 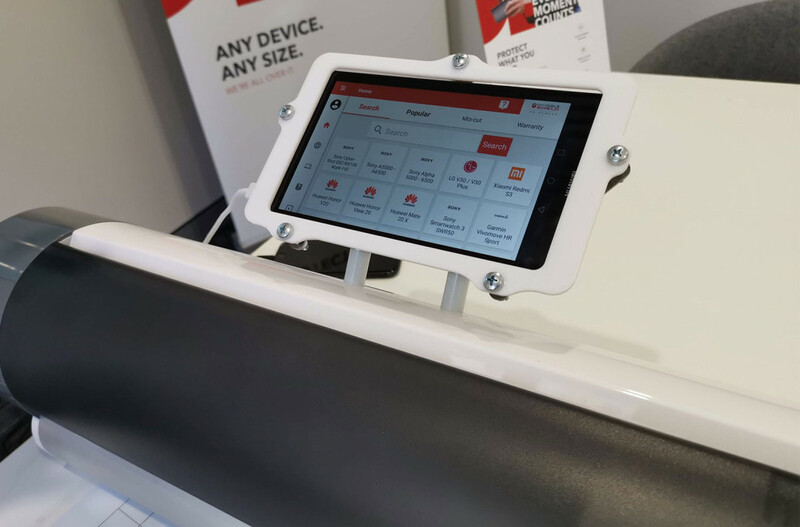 The idea is less a printer and more an etcher, but basically creates a screen protector for any device in store in less than five minutes. Better, once the Invisible Shield on Demand screen protector has been made, the store will install it on your device for you. We tested it recently in Sydney, and the idea is sound: if you have a product that needs screen protection, this thing will make it quickly. In fact, it’s not just screen protection, with support for the backs of phones as well. Essentially, you could protect the front and back of a phone with a slick film, preventing scratches to the device and not only keeping it looking schmick and pretty, but also increasing resale value. While it has been primarily geared at phones, we found Invisible Shield’s specialty system could also handle other devices, with its tablet loaded with other devices, too. Wearables like the Apple Watch are unsurprisingly a part of the system — because a broken Apple Watch is a horrible thing to see, and then a horrible price to pay — and we even found the recently reviewed Samsung Galaxy Watch in its database, something we hadn’t seen a screen protector for anywhere. But it’s not just wearables and phones, either. 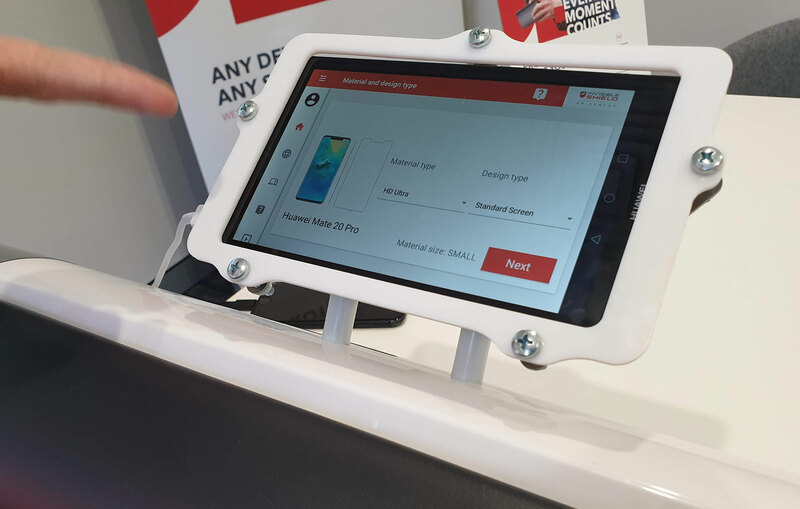 Zagg’s Australian people showed Pickr that select cameras were a part of the system, as were tablets like the Apple iPad and Microsoft Surface Pro, making it easy to print a screen protector for these devices, and possibly something for the back. Better, if the device isn’t there, Zagg’s people can apparently update the database with details for a product you might be looking to add protection for, so if it’s not there one day and you ask for it, the details might just be waiting in the printer the next time you arrive. With new phones and wearables the obvious target for Invisible Shield on Demand, you’ll more than likely hear about this when you buy a new product, but even if you don’t, you should just be able to walk in off the street and get a phone, watch, camera, tablet, or even a pair of earphones matched with a custom screen protector in minutes. Yes, we said earphones, because believe it or not, Apple’s AirPods are part of the system. You know, for folks who don’t want their tiny white earpieces to get scratched. Frankly, we’re just excited to find out that practically any device can get screen protection, a necessary evil in today’s world when a fall can leave a phone ruined beyond belief. Scratched and broken screens are, unfortunately, just a part of the world we live in, and while you can usually replace these, the cost can be frustrating to live with. Prices can range from $89 to $1199, taking up much of the cost of a new device, though screen protection can help absorb some of the impact and reduce damage, if it even allows it to be inflicted in the first place. It’s not the be-all end-all, mind you, and a better approach includes a case to reduce damage altogether, but we’re not yet at the case printing business, though we did ask if that was coming. For now, screen printing is a first step, and it’s one we’ll take, as Australians get their protection printed on demand for as little as $29 at select stores across Australia. You can find Zagg’s Invisible Shield on Demand in every major city in Australia, usually at Harvey Norman stores, though other mobile phone retailers will be adding them throughout the year, mostly at Optus and Vodafone stores, we’re told. We’re waiting for a complete list, but it looks like Harvey Norman stores across the country will be your first point, and if you want to try it, just ask the store whether they have Invisible Shield on Demand in store. 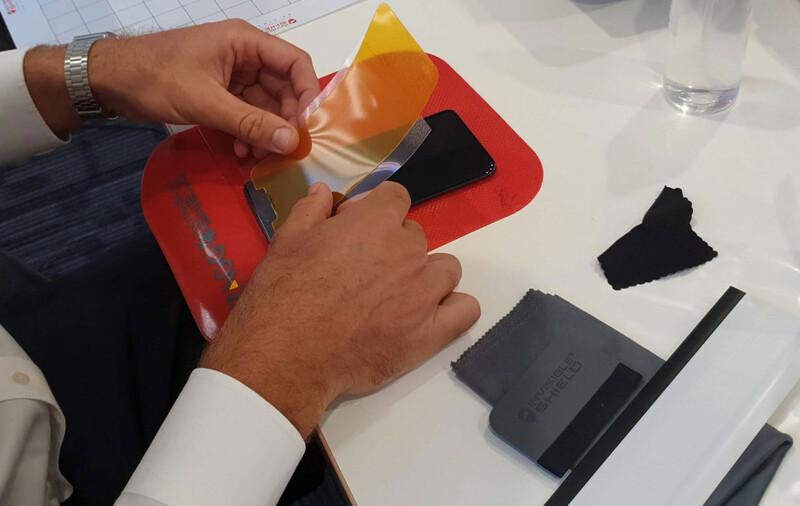 Once the screen protector is printed, someone from the store will install it on your device for you.